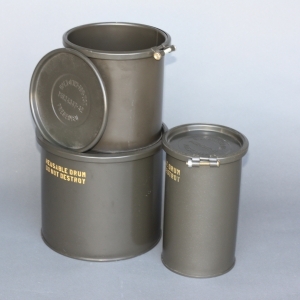 Reusable Drum, Metal Shipping and Storage container MIL SPEC Mil-D-6054E containers most commonly used to ship supplies to our troops domestically and internationally. Handles- spring loaded or sling-type, located per your request. All military drums can be tested to the latest UN specifications and manufactured to conform to DOT regulations. Copyright © 2019 Goodwin Robbins Packaging Company Inc.